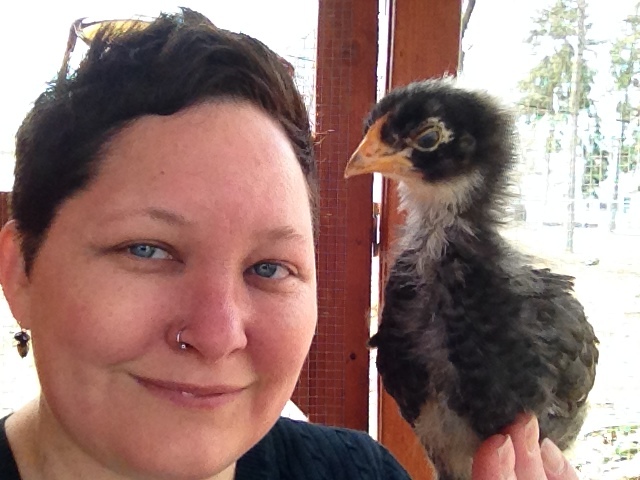 Jilli, with Baby Girl, on a visit to the chicken coop. Three weeks in, and two of the chicks have names. I put this disclaimer on it because Matt claims to have ultimate veto power. I’ve asked him for his suggestions, and so far he’s come up dry. So I’ve gone ahead and named two of them. I was tiring of calling them by their breed name, and the names I selected came organically. Gigi is filling out her feathers, and may have the beginnings of a crest atop her head. I named the Olive Egger first. She’s noticeably larger than the other two, and is the first to try something new. But her large stature in no way makes her a bully. So I named her Gigi (short of Gentle Giant). Her gray feathers are stunning, and we’re starting to see what may be the beginning of a crest atop her head. Also, her comb is pronounced. No doubt in my head, Gigi will be a showstopper when she’s full grown. I named the Dominique next. She’s the smallest of the three, but the most curious. She’ll crawl right into my cupped hand, and climb up onto my shoulder, sitting there like a parrot. She never runs from my hands. She’s also a little stinker. Twice now she has flown out of the brooder when I lift the lid, only to land on the floor in front of Charlie. Both bird and dog behaved, and no feathers or fur were lost. I named this one Baby Girl. The Black French Copper Marans is still up for naming rights. And of course, I’ll defer to Matt on this decision. We took all three out to the chicken coop for a romp this afternoon. This gave me a chance to hold each one in a less stressful situation than the basement. Baby Girl climbed up and down my arms, and needed a nudge to hop off my hand. Gigi was comfortable as well, allowing me to ruffle her feathers. 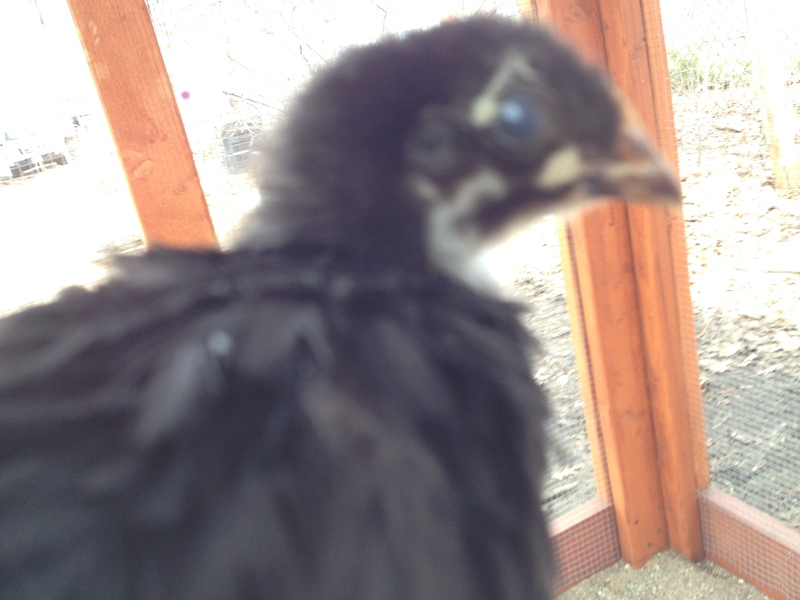 Blurry pic of the Black French Copper Marans. I couldn’t believe she stayed still long enough for me to get this. But the greatest surprise was the Marans. Down in the brooder she runs squealing from my hands. And when I do manage to pick her up, she writhes, flapping her black wings as if in a fight for her life. 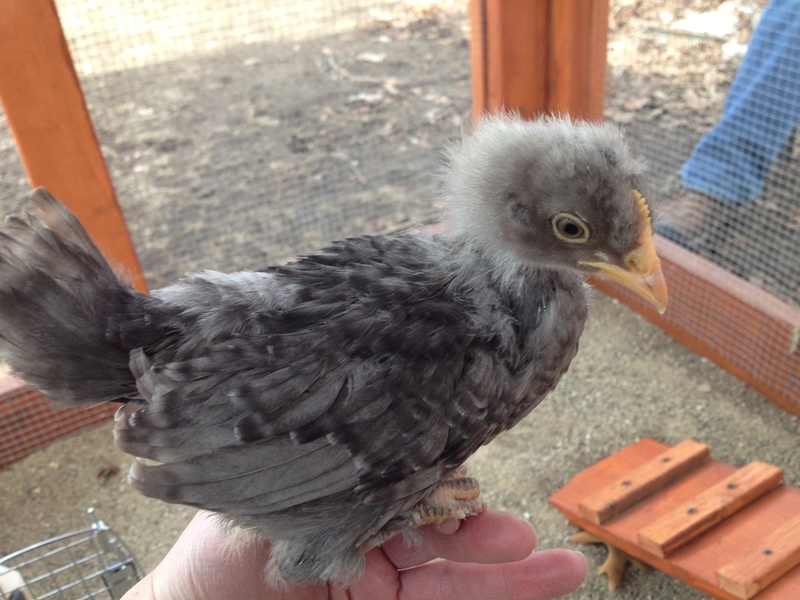 The Marans allowed me to pick her up, and she sat calmly in my hand. I was able to pet her, rub her crop, her belly, the length of her back. I simply could not believe it. We had turned a corner. I took one blurry photo as proof. I couldn’t let this breakthrough slip by without documenting it. She’s out of focus, looking at me out of the corner of her eye. Feathers fluffed. Content. BONUS VIDEO: The girls check out the coop, and Baby Girl takes a poo! ← Week two: Field trip!